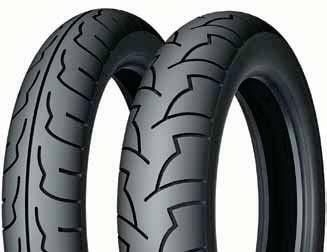 Excellent value in a bias-ply replacement tire s Outstanding combination of performance and durability at a very attractive price. s 20% longer tread life than previous generation of MICHELIN ® bias-ply tires. s Wide tread blocks on the rear tire mean more road-rubber contact. s Longitudinal and lateral tread grooves for effective water evacuation. Comprehensive range of sizes & speed rating s 25 sizes available to ﬁt a wide range of touring, sport touring and standard bikes. The M62 Gazelle provides dependability and economy. It dampens road shocks and offers a comfortable ride, while its robust carcass resists damage and punctures from road debris. Tube Type.